It's the South of England koi show this weekend, and the first run out for my home bred kohaku's this year. Another massive honour... which I've shared before, but I'm so chuffed about, I'm sharing again.... they've only gone and put my baby champion from last year's show on the show poster! (it's the one on the right). 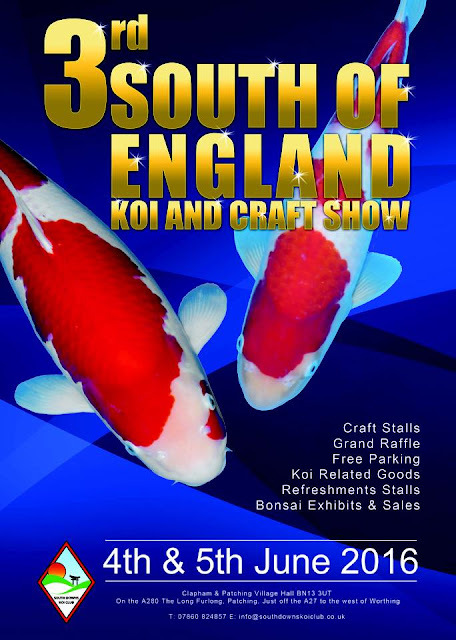 Spent some time today perusing koi for the show, and it's going to come down to a final selection decision on Friday morning. My best few have frustratingly grown more than I expected over the last 4 months and will be at the bottom end of size 3 rather than in size 2 where I would have preferred them to be. Still haven't found any small enough to enter size 1, but we'll have a really good hunt! And we have some options for size 2. I'll also bring along some of the fish that I exhibited last year, which are now nissai.